If you work a desk job, you’ve probably heard the warnings about a sedentary lifestyle at least a few (dozen) times. Many of us spend the majority of our time sitting at work. In fact, insurance sales agents in particular spend more than 80% of their workday sitting, on average. We’ve all got important work to do in the office and personal lives to maintain, so it sometimes seems impossible to meet the ever-elusive 10,000 steps. In fact, when ranked by citizens’ average steps per day, the United States comes in at 30 out of 46 countries with an average daily step count of 4,774. Sometimes breaking a lofty goal into smaller, achievable segments is the most effective route to success (as we’ve covered in a previous post). Aim for two to three minutes of activity per hour to keep your blood flowing and your mind fresh. Many fitness trackers will remind you to move each hour, but you can track activity on your own by setting a calendar reminder and sticking to the time goal. Are you a grazer? If you eat several small meals throughout the day, try eating one or two on the move. It’s tempting to continue working or catch up on news and social media on these little breaks, but a lap around the office may be the best addition to your fruit or granola bar. If you don’t already take the train or bus, just trying it out can increase your daily activity as you move around stations, switch routes and travel to and from your final destination. And if you’re already a public transit rider, try getting off a stop or two early and walking the remainder of your route. If we use an average of about one kilometer between bus stops, you could easily walk a 5K during your workday. One kilometer is about 1,300 steps, so adding an extra kilometer of walking each way would fulfill more than 25% of your 10,000 step goal without any additional activity the rest of the day. Bookend your workday with light activity by parking further away from the office. We know it’s tempting to beat Bob to the best spot in the lot, but you’re the real winner when you’re improving your health. Taking the stairs is classic advice for working in more activity, but it’s also a great way to level-up your daily activity goals. Walking around is certainly better than standing, but climbing up and down stairs for even a few minutes boosts the intensity of your daily activity. Depending on weight, people burn 450 calories per hour on average climbing up and down stairs. If you climb for only two minutes, you could burn around 15 calories. Going to the restroom? Getting water? Grabbing copies off the printer? Great — but switch up your route. Try using a restroom on the opposite side of the building, or on another floor. Instead of taking a direct path to the printer, weave in and out of some cubicles. Bonus points for saying hello to coworkers you don’t get to see often! Hydration is a key element of an overall wellness routine (including oral health! ), and you can use water and steps as a wellness double whammy. Keep water at your desk and try to take at least several sips each hour. You’ll stay hydrated — and when nature calls, you’re being more active with each trip to the restroom (especially if you take the long way). Funny little coincidence, huh? 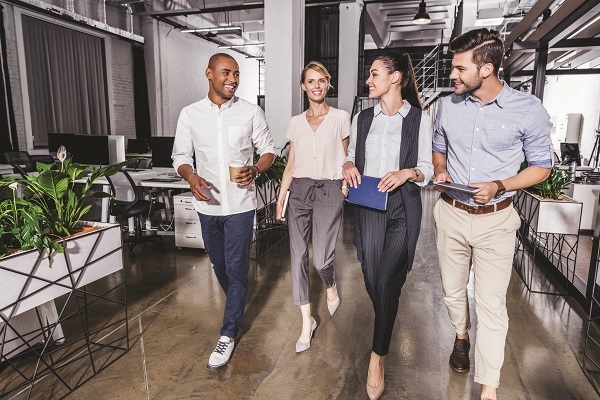 We hope these tips can get you and your employees up and moving. Have any suggestions, or want to share your progress? Send us a quick email at newsletters@delta.org. Like what you’re reading? Never miss an Update — subscribe to our email list for brokers, agents and consultants. Are you a benefits decision maker, administrator or HR professional? Subscribe to Word of Mouth, our newsletter for businesses.